More and more winter sport enthusiasts discover skiing in the Czech Republic. Being located in the heart of Europe the country is surrounded by mountains. The ski resorts have invested a lot in the past years and offer a wonderful alternative to the Alps, which you will notice most regarding the vacation budget. Most of the resorts can be found in the gigantic mountain range surrounding the largest mountain in the Czech Republic: Sněžka at 1,603 meters (5,259 ft). The region of Špindlerův Mlýn with 25 kilometers of pistes is the area with the most kilometers of pistes in the country. 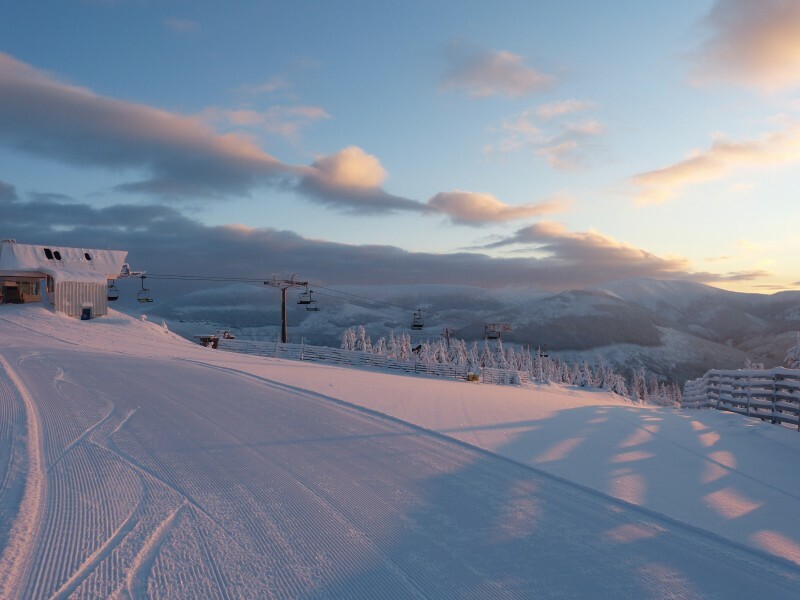 The largest ski resort is the neighboring Černá hora–Pec pod Sněžkou which provides 40 kilometers of pistes right at the foothills of Sněžka. It would be a much shorter journey to visit the skiing regions in the western part of the Czech Republic. In the Bohemian Forest shortly after the border to Bavaria there are numerous slopes at Špičák near Železná Ruda. Further south the region of Lipno welcomes winter sport enthusiasts as well. It is especially popular with families and scores with wonderful panoramic views. From the slopes skiers and snowboarders have a fantastic view onto the Lipno Dam, the largest lake in the Czech Republic. In the Czech part of the Ore Mountains in the North there are also numerous ski resorts. The largest of them all is Klínovec which offers a joint ski pass with the German resort Oberwiesenthal Fichtelberg. In lower lying parts of the Czech Republic grape vines and hop flourish in the warmer months. Vacationers in winter can surely profit from this as well! Beer and wine are enjoyed best with classical regional delicacies such as Czech dumplings (knedlíky), Gulash (guláš) or Buchteln (sweet rolls called 'buchtičky').